Compositionally speaking, this program had a certain straightforward logic: a solo piano work preceded a duo for the rarely heard combination of violin and cello; following intermission, the three instrumentalists combined forces. The reasoning behind the mix of composers – Sergei Rachmaninoff, Zoltán Kodály, Anton Arensky —was a bit harder to fathom, though Arensky was actually one of Rachmaninoff’s professors at the Moscow Conservatory. This spicy Hungarian sandwich on Romantic Russian bread did, however, make for a piquant combination. Ning An, the young upstart of the group, is a formidable keyboard talent. His rendition of Rachmaninoff’s Variations on a Theme of Corelli, Op. 42 featured strikingly precise articulation and a graceful virtuosity. In Rachmaninoff’s hands, these twenty variations, based on a set of variations of the familiar Folia theme by Baroque composer Arcangelo Corelli, are positively etude-esque in scope and construction. Their wide-ranging emotional spectrum arcs from majestic to impish to rollicking to introspective, all moods lucidly conveyed by An. His approach is one of controlled passion: refined, deliberate, emotionally charged. An cast a rather regal, elegant bearing onstage, his lanky frame swaying gently as his Rachmaninoffian-sized hands adroitly capered over the keys. A captivating performance. Kodály’s Duo for Violin and Cello, Op. 7 is one of a regrettably limited number of pieces crafted for this instrumental combination. Somber and angular, this work, penned at the start of World War I, seems to reflect the dark mood of the time. Kodály, along with compatriot and contemporary Béla Bartók, was an inveterate ethnomusicologist who ferreted out and catalogued multitudinous Hungarian folk songs. This is readily apparent in his Duo, which, with its generous use of pizzicato technique and modal key structure, evokes a decidedly Eastern European flavor. This impassioned, declamatory, melodically acerbic and technically demanding music was handled with sophistication and reverence by the instrumentalists. 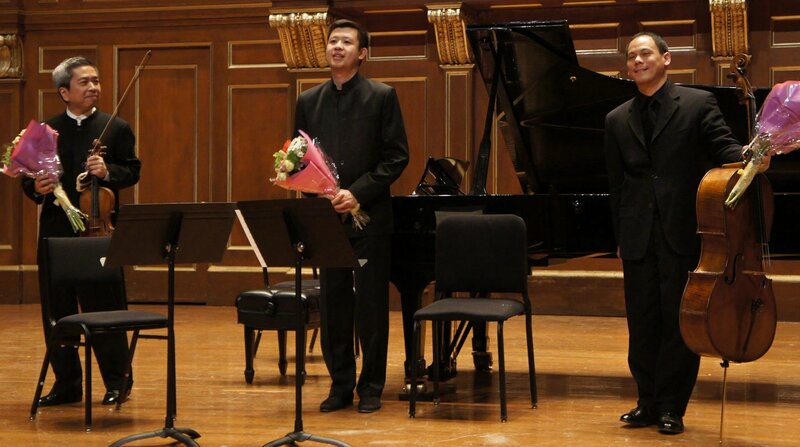 Violinist Nai-Yuan Hu, the elder statesman of the group, performed with a high degree of stern-faced competence; Bion Tsang spun a warm, full tone on the violin’s larger cousin. Both players clearly communicated the yearning and pathos of the piece, painting a desolate music landscape with a passionate performance. And, what’s this? Almost as impressive as the music-making was the decided lack of coughing and spluttering between movements, reflective of a highly absorbed, attentive, and/or healthy audience. Refreshing! This concert turned out to be much more than the “Instrumental Minds” title suggested. These performers wore their hearts on their sleeves.